This course has been developed to easily detail the nature of projects over 100 days to increase your ability to effectively implement strategic analysis and planning. An interactive digital workshop designed to introduce the digital technologies, services and business models disrupting today's markets. This course will help you to understand how to spot and harness digital opportunity and develop the building blocks for the implementation of digital business strategies. 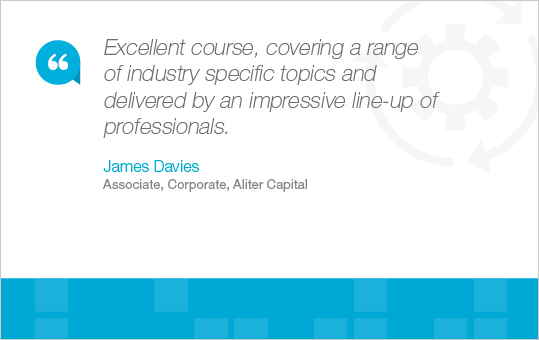 A course specifically designed for junior investment professionals looking to understand the due diligence process. Its practical and interactive setting will provide tips, advice and guidance whilst walking through each separate investigation stage culminating in a more effective use of time and cost. Improve your team's performance by enhancing your leadership qualities. Through learning the traits of successful leaders and being aware of your tendencies, you will work towards improving your impact on the team and ultimately the company. During this course, participants will examine the responsibilities of FDs and CFOs and how to support investors effectively, gain an overview of debt structuring, valuations and preparing for an exit, and understand the impact of the latest legal, tax and accounting changes. You will learn the needs of LPs and how the industry has continually evolved in order to understand best practice techniques. Analysing the fundraising process, fund structuring and more through this course will heighten your knowledge whether you have spun out a captive fund or you are in the process of setting up your own operation. This course provides an overview of the legal elements relating to private equity transactions, identifying commercial issues and producing clear instructions to lawyers. This course provides an overview for venture capital practitioners of the commercial issues covered in legal documentation. It specifically covers what needs to be addressed rather than the legal fine print. Staying up to date and showing your proficiency on the legal and corporate governance of a business is a prerequisite associated with being a Non-Executive Director (NED). This course focuses on your responsibilities whether you are a first time or experienced NED. Negotiating is part of many aspects of business but being able to do it effectively, especially when the deal can become quite complex, requires effective planning. This course will build on your core negotiating skillset through its interactivity and use of real life case studies.